The news of the Martavis Bryant suspension hit Steeler Nation hard on Saturday, and now that it’s all but official he won’t take the field in 2016, comes more news about the young wide out. The news is that the 24-year-old Steelers receiver will be not only appealing his suspension, but also will be checking into a rehab facility to get his life turned around. 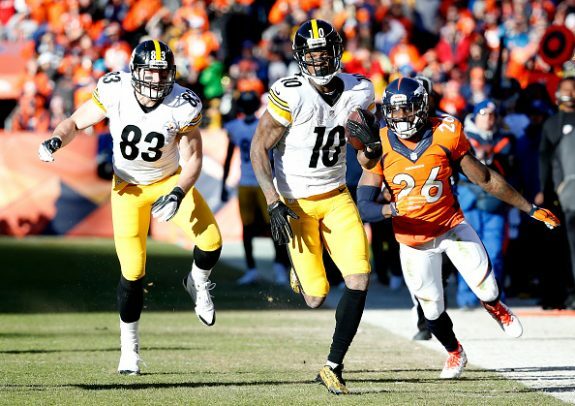 Facing indefinite banishment for repeat violations of the NFL’s substance abuse policy, Pittsburgh Steelers receiver Martavis Bryant will check into rehab and undergo evaluation for depression issues, one of his agents, Brian Fettner, told USA TODAY Sports. Fettner confirmed Bryant is appealing the ban, though getting it overturned is seen as a long shot. It stems from multiple missed drug tests, Fettner said, while also acknowledging Bryant has a problem with marijuana. Bryant had the chance in the NFL to be one of the more up and coming wide outs, but now all of that is on the back burner, as obviously there’s bigger issues in his life than becoming one of the best receivers in the game. 2 Comments on "Report: Steelers WR Martavis Bryant Set to Check Into Rehab"
This is sad and its a rediculous waste . This kid has the play making ability to be one of the best receivers in the NFL . With that being said , Bryant had to have failed at the very least , 2 drug tests since his suspension last year , for the league to be wanting to suspend him for the whole year . Now we know why they resigned Heyward Bey the first day of free agency . At the end of the day , the Steelers need to cut the cord on this kid and release him . Yes its a tough call to make but hes proven he cant control himself and he has to be constantly watched . The Steelers dont have time for that . Move on . I cannot imagine the Steelers giving him any more chances. The CBA states on the 6th fail it’s a 1-year suspension. Six. That is a huge number. He was in rehab once already – that should have been his wakeup call. On a side note, I have a child who spent 1 year in drug and alcohol rehab. This 3 week nonsense is nonsense. I cannot imgaine any adult rehabbing on such a short stint in a facility. His time is done with the Steelers – and maybe the NFL.